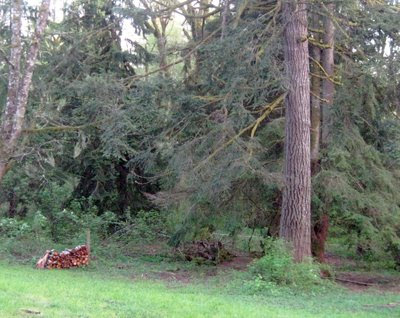 If you are a regular visitor to this blog or my website, you know I am monitoring two properties east of Portland, OR. I recently received word that there was some possible activity at what I call Site #1. At approximatley 12:30 am on the morning of May 8, 2009 the property owner's girlfriend (we'll call her Madam X because it sounds mysterious, though that's not her real name) was alone in the house, her boyfriend being out for the evening. She went outside on the upstairs balcony to smoke a cigarette. As she finished her smoke, she heard what she initially thought was the sound of children playing in the creekbed, which was about 50 yards away. When asked if she thought if there was more than one animal, her reply was "definitely". The neighbors on the other side of the creek do not have children, and the other closest neighbor is an elderly lady. Both of these homes are more than 100 yards away from the porch where the woman was standing. She thought it was strange to have kids in the creekbed so late on a school night, and was wondering where they had come from when they stopped the chatter. A repeated screaming replaced the chatter, lasting almost two minutes, as estimated by the witness. Madam X said that it sounded kind of like a child screaming, but loud enough that she never even considered it to be from a human source. Madam X had seen a possible bigfoot from this same balcony back in August of 2008. She is aware of the possibility that sasquatches might be visiting the property occasionally, and I am happy to say she tried very hard to record the screams. Unfortunately, her cell phone voice recorder did not pick up any noises, which would be expected considering the kinds of microphones on those devices. She even had the presence of mind to try recording it on the answering machine, but to no avail. Kudos to her! It is partly because of the attitudes of the people on the property that I believe we have a decent shot of getting some sort of visual evidence from this site. 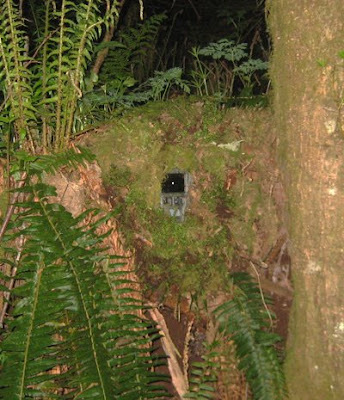 The property owner recently invested in a third generation nightvision monocular (PVS-14), which Madam X ran to get. When she turned the unit on, the screaming stopped for the rest of the night. Is this a coincedence? I don't know. It makes me wonder if there is an infrared LED on the scope that turns on when the unit is powered up. 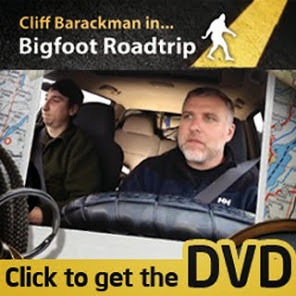 I think sasquatches probably see well into the infrared, and I know I have shut down some activity with IR LED's before. If you know something about the PVS-14 having this feature, feel free to post in the comments below, or email me. I will check the next time I'm around one of these units. Today I went to the property to look for footprints and to check the trail cameras that are deployed there. I got some great photos, but not of sasquatches. On the way back home, I dropped by the other study site, which I creatively refer to as Study Site #2. Nobody was there when I arrived. Coyotes were vocalizing a little ways off to the west, and some local hound joined in occasionally. 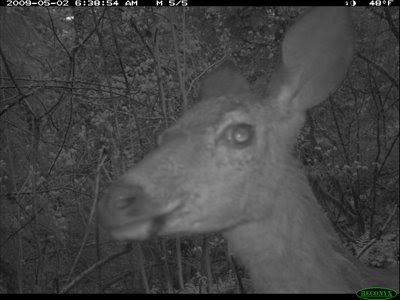 I traded out the memory cards in the two trail cameras deployed on this property, and walked through the brambles near the creek familiarizing myself with the gully. There was deer sign everywhere, though it quickly got too dark to easily find tracks. 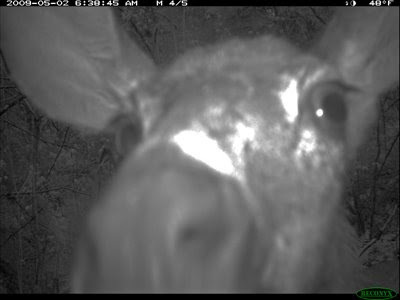 The above trail camera obtained some funny pictures of a deer. Enjoy. 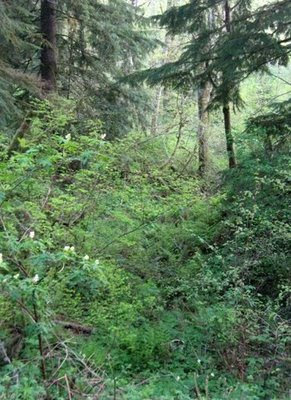 I will continue to update you on the Sandy River Project as things develop. So interesting! I love your updates. 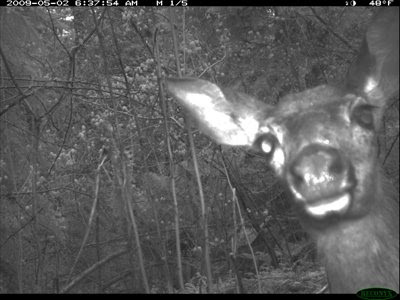 I love the pictures of the deer and 'Parker'! Interesting how the animals seem to make a bee-line for the camera....does it maybe emit a high frequency pitch that they can hear?